Bodo Tribe of Assam - are known to be the earliest settlers of Assam, and the first to cultivate rice and rear silkworms. The Bodos are considered to be the largest ethnic and linguistic group of the Brahmaputra valley and they reside in the north-western parts of Assam. The Bodos are the largest among the Bodo - Kachari Clan. The word 'Bodo' has been derived from the word 'Bod' which means Tibet. The Bodos speak Tibeto - Burmese language or the Bodo language. Bodos also have a language of their own called Deodahi. They are considered to have reached the Brahmaputra valley via Tibet and settled in the foothills of the eastern Himalayan range which includes the whole of Assam, Tripura, North Bengal and parts of Bangladesh. Bodos are fervently proud of their heritage and culture. Apart from farming, weaving is another integral part of Bodo culture. Many families rear their own silkworms, the cocoons of which are then spun into silk. Bodo girls learn to weave from a young age, and no Bodo courtyard is complete without a loom. The Bodos are also expert craftsmen in bamboo products. For most of the Bodo tribes, rice is the main food which is generally accompanied by mouth watering dishes made from pork or fish. Bodos are also fond of the conventional drink called Zu Mai. Zu means wine and Mai means rice. Bathow Puja is an important religious festival of the Bodos. The different forms of this festival are - Garja, Kherai and Marai. Among these Kherai is the most significant and the most important festival of the Bodos. Superstitious by nature, Bodos believe in rebirth. 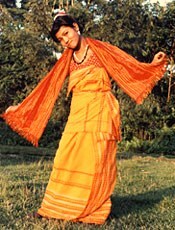 The Bagarumba or Bagurumba dance and Deodhini Dance are the important dances of the Bodos. The Bagurumba dance is also called the “butterfly dance” as the dancers dance like butterflies. The term Deodhini is derived from the Sanskrit word “Deva” which means god or deity and “Dhani” means sound, i.e. echo. Hence the term “Deodhini” literally means the sound or utterings of a god or deity.